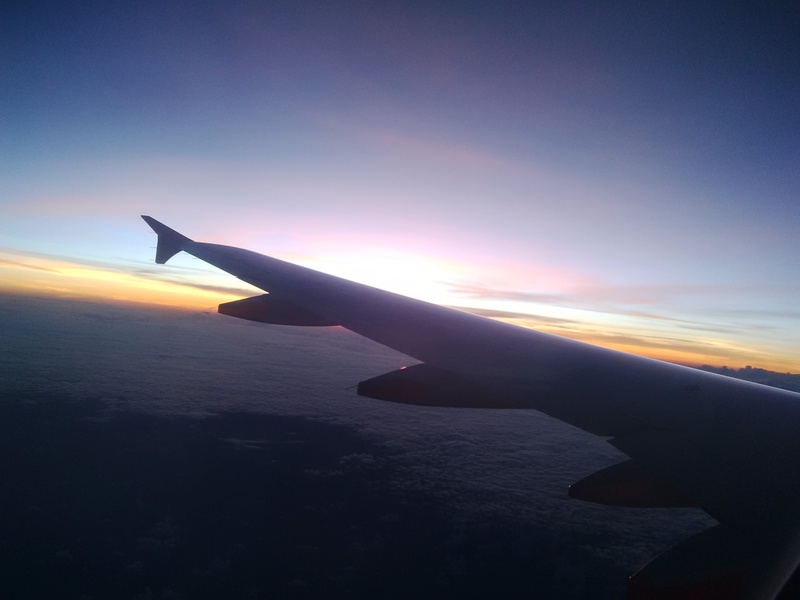 ✅ Trip Verified | Being frequent-flyer is easy to pick things what’s right and wrong in the airports. Cairns airport was with very limited choices for food before Hudson cafe came in. We thought it will improve choices and services but it made it more worse. Even if you to check in before time you cannot do your duty free shopping and get a cup of coffee and relex because of slow service at Hudson all long queues bad service bad food menu. Since they’re open till today I never able to get a quick coffee without waiting period for 20 minutes. International airport with one cafe where flights always delayed. Not Verified | Really underwhelming Airport. The Domestic Terminal feels more like a mall than an Airport. Though dimly lit, there are a few food and shopping options to help pass the time. Signage is quite poor. The airport smells damp (like most tropical airports), which could be fixed with better ventilation. International departures is a sad, sad terminal. Between 12 and 5pm, is is a barren wasteland with only staff around. If you're more than three hours early for your flight, the only food options are a small internet cafe. It is over-priced and doesn't even have ice cream, however, their coffee is nice. Toilets are gross and smell. Could do with some TLC. More signage is also needed throughout the airport. Free WIFI is offered - It is somewhat slow but does the job - use mobile data, if you can. It cost $3 to use a luggage trolley, $30 to report lost property, and about $10 for a return bus fair into Cairns. Not a huge fee, but quiet considerable when compared to the free connectors that Melbourne and Adelaide offer. Duty Free shopping is always a treat, the staff there are lovely. "Arrivals never fails to disappoint"
✅ Trip Verified | I use this international terminal frequently. Departures always seem to be smooth and polite with check-in staff who show concern for passengers. Absolutely no complaints there. However Arrivals never fails to disappoint, including my most recent arrivals experience. The staff who separate disembarking from continuing/transiting passengers are always abrupt to the point of being rude (no one wants to be barked at within seconds of stepping off a flight), without a smile in sight, and not making things any easier for themselves by not having any clearly visible signage indicating what documents are required for the mainly Chinese passengers who don't speak English. It's not a good first contact with Cairns. At the immigration point I chose to use the Smart/e-passport gate. This is often closed, but this time it was open. So I went to it, answered the questions on the screen, took my card, proceeded to the photo point, where the card was rejected and I had to join the (now longer) queue for manual immigration processing. I mentioned to the immigration officers that the e-gate wasn't working and the response was that it was not available for this flight. I suggested if that was the case they should rope it off and make it clear that it wasn't operating so time wouldn't be wasted going through the process. Just a dead stare in response and no action. OK, so on to baggage collection and customs which was fine. Then out to the taxi stand where signage for unsuspecting visitors is so inadequate that most visitors stand waiting for a taxi having no idea that a taxi will not come unless you press an almost invisible button on a wall that is not near the waiting point to let the taxi company know you're waiting. Once again I was having to help visitors make the taxi call - this is despite having written twice to Cairns airport about the issue. 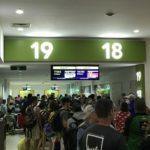 These are small things to fix and can dramatically affect a person's view of the destination but in my view the current situation is not up to international arrival standards. "all the windows are blocked off"
❎ Not Verified | Being as it was extremely hot and humid I thought a few hours in the air conditioning watching a major international airport arrivals and departures would fill in the morning. Imagine my dismay when all the windows are blocked off and the only way to see the planes is to sit in the smoking section outside. "no passenger management or organization"
❎ Not Verified | It seems like an odd choice to have 2 planes leave at the same time to the same destination from neighbouring gates when they share neighbouring gates with very little separation from which gate is which gate is which. The hall to board the plane was crammed with people before they even began deplaning. I felt bad for the people just try’s by to get off the plane. It seems like there is no passenger management or organization. Not enough seats for how busy it is and the announcements were inaudible. Do better Cairns. ✅ Trip Verified | Sound system is very difficult to understand (speakers or construction materials?). Toilets smell disgusting and have been for several years, I have used numerious ablutions in remote regions in Australia that smell better. This is a tourist destination, I wonder what impression it leaves with visitors? Food costs are unreasonably expensive, $2 for small piece of fruit! Luggage was left in rain on last trip (4wks ago) and contents got wet. WIFI access poor. "really liked the staff in general"
✅ Trip Verified | I really liked the staff in general. They were very friendly and smiling comparing to many Australian airports. The baggage drop counter was closed when I arrived but the staff at the service desk immediately checked me in. The airport is clean with adequate number of seats. The signage is not well designed and you need to look for them. They number of shopping outlets at the terminal is low considering that it's an international airport. 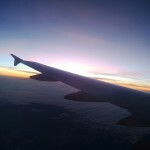 Commuting to and from airport is very easy and there are enough transportation options to choose from. 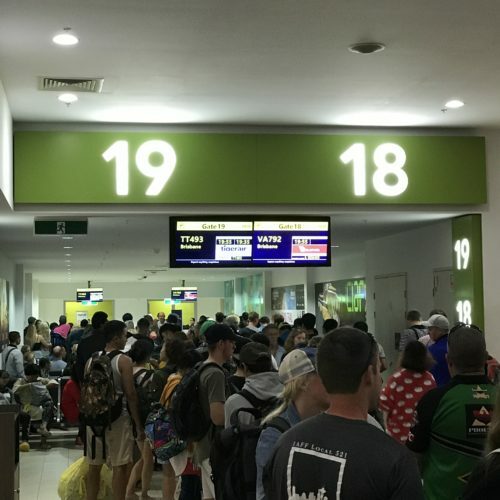 ❎ Unverified | This airport whilst modern and clean has major problems The check-in procedure is usually long queues and waiting extended times. The departure lounge has exceptionally bad acoustics, most announcements cannot be understood. The food they serve is outrageously priced except for hungry jacks. The signage is poor with the all the departures and arrivals for the day in a very small fonts for their distance from the ground. Some of the gates do not have signage indicating what flights are departing from the gate until the flight starts boarding. The airport WiFi was hopeless and kept requesting that I sign in but would not bring up the sign in window. Seating is very hard and not comfortable. Star rating needs a Zero Stars rating. 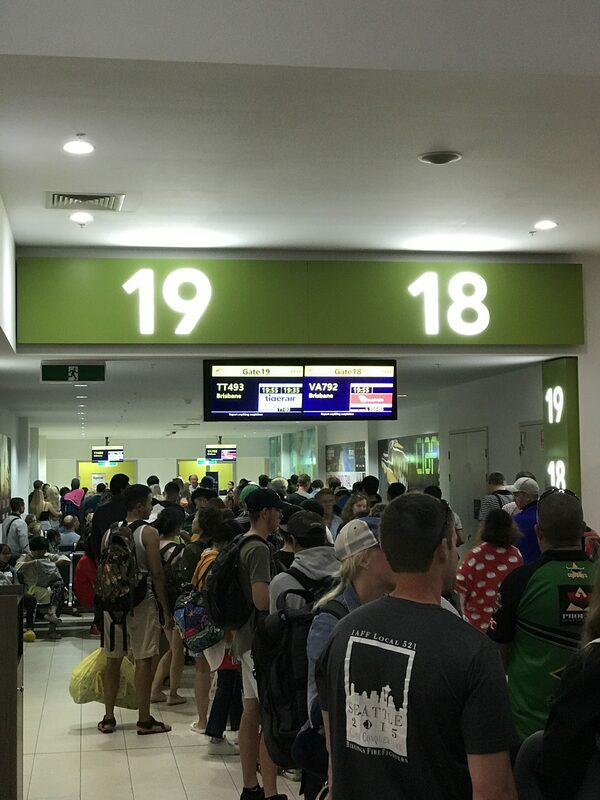 "airport has a variety of seating options"
✅ Verified Review | Arriving at Cairns Airport was simple. Process through security efficient with both lanes being used. For a large regional airport, I find the shop varieties are adequate, the food options are good ranging from healthy to fast food. There is a lot of space and the airport has a variety of seating options. I did note it can get busy, but airline staff ensure their passengers are processed promptly out to the aircraft. The Indigenous items on sale are interesting and reasonably priced. Airline lounges located not far from boarding areas. I really enjoy visiting Cairns and their airport. "continues in its reputation as a shocker"
❎ Unverified | This airport continues in its reputation as a shocker. The check-in procedure is usually long queues and waiting. Then the departure lounge is uncomfortable with exceptionally bad acoustics. Announcements cant be deciphered, workers play shrill music on their mobile phones and the coffee shop staff are loud. The food they serve is outrageously priced and poor quality. Especially the $8.50 Aussie pie. BYO recommended.